Beer in moderate amounts can be good for heart and blood vessels mainly because of the alcohol in it. There is strong scientific evidence that consumption of 15–30 g of alcohol per day is associated with a 25% lower relative risk of cardiovascular disease mortality compared to abstainers. This is unrelated to the type of beverage. Beer in moderate amounts may be good for heart and blood vessels mainly because of the alcohol in it. Consumption of 15–30 g of alcohol per day is associated with a 25% lower risk of cardiovascular disease mortality compared to abstainers. At this level of alcohol intake, coronary heart disease risk is reduced by 34%. The risk for stroke is lowest (20% less) at an intake of up to 15 g of alcohol per day. Increased HDL cholesterol, improved insulin sensitivity, decreased fibrinogen and reduced inflammation markers are physiological mechanisms that explain this association. On top of a healthy lifestyle, moderate alcohol consumption may have a cardiovascular protective effect. People having cardiovascular disease may benefit from moderate alcohol consumption. There is a J-shaped relationship between alcohol consumption and the risk of stroke. The relative risk is lowest (20% less risk) with an intake up to 15 g of alcohol per day and increases when consumption is more than 15 g per day.103 Ischemic stroke is the most common form of stroke, where a blood clot blocks the blood flow in an artery within the brain. For both men and women the lowest relative risk (around 15% lower than abstainers) was seen with consumption of around 12 g of alcohol per day. Consumption of more than 35 g per day for men and 44 g per day for women increases the relative risk.108 In men, there is a positive linear relationship between alcohol consumption and the risk of hemorrhagic stroke. For women, a J-shaped relationship is found with the lowest relative risk at 12 g of alcohol per day (31% less).108 A hemorrhagic stroke occurs when a blood vessel bursts within or around the brain. Cardiomyopathy is a heart muscle disease. It can have different causes, but one of them is poisoning of the myocardium (heart muscle) due to chronic alcohol abuse. An observational study showed that people consuming around 240 g of alcohol per day for an average of 16 years developed cardiomyopathy.113 Therefore it is unlikely that alcoholic cardiomyopathy could result from moderate drinking. Moderate alcohol consumption can improve insulin sensitivity (see Chapter 6). 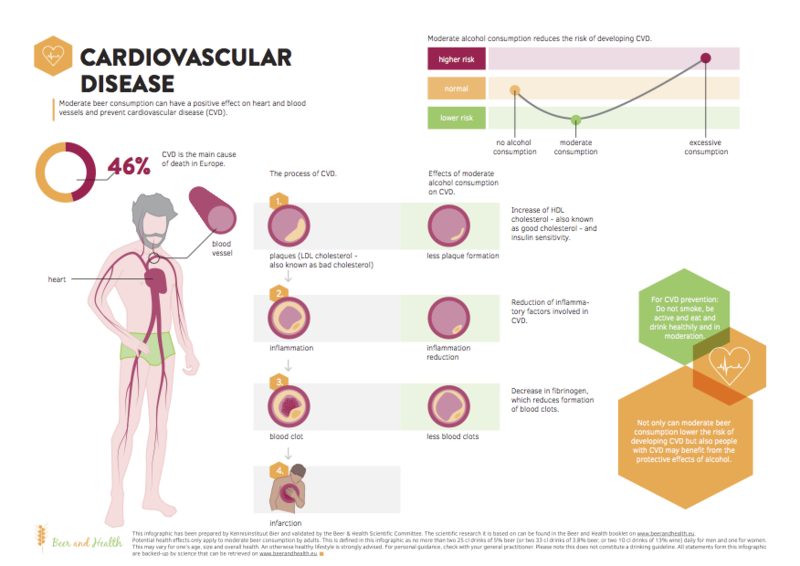 Since insulin resistance is linked to CVD, the improvement of insulin sensitivity may be an additional mechanism by which alcohol consumption reduces the risk of CVD. Consumption of about 30 g of alcohol per day can reduce circulating levels of fibrinogen.121 This protein is the precursor of fibrin, a cofactor for platelet aggregation. 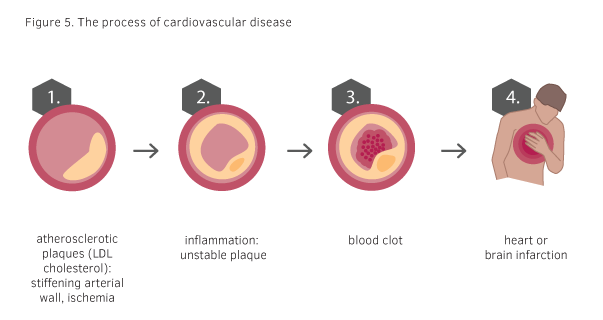 By decreasing fibrinogen levels, blood clots are less likely to form and as a result, this might decrease the risk of an infarction. 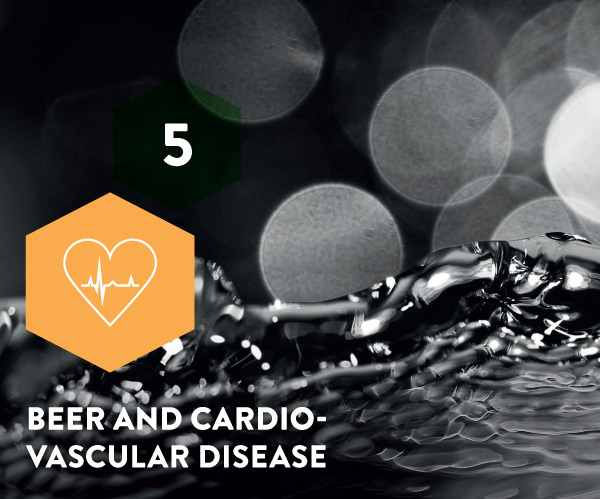 What is known about specific beer and heart health? 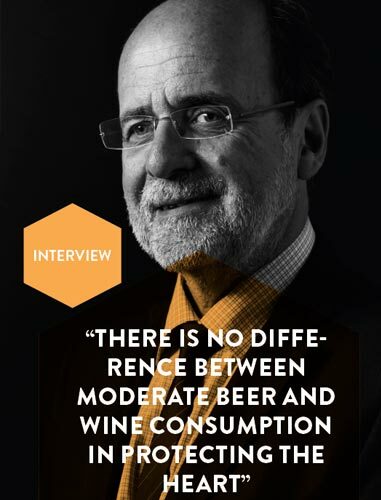 The Mediterranean diet is often associated with wine, but can the wine be replaced by beer?